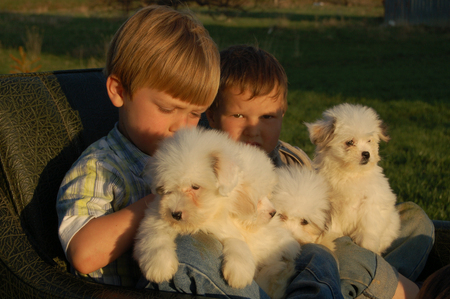 Coton Jewels is breeder of Coton de Tulear, in the heart of beautiful Waterloo County. Our dogs are family-raised, bred for personality, and gently cared for. We establish a close bond with the puppies to ensure healthy and happy puppies. This helps form loveable and sunny dispositions from the start and makes them an ideal puppy for you and your family. Coton Jewel puppies are registered with Canine Federation of Canada, microc-chipped, vet-checked and come with first shots and a health guarantee. All parents are on site. Our state of the art, registered kennel is well ventilated and includes in-floor heating and a shaded outdoor run. Come visit our farm to view and cuddle the puppies. Phone us Monday to Saturday at 519-698-9887 or 1-888-559-9926 for appointments.